Carrot Cake | Pretty. Simple. Sweet. 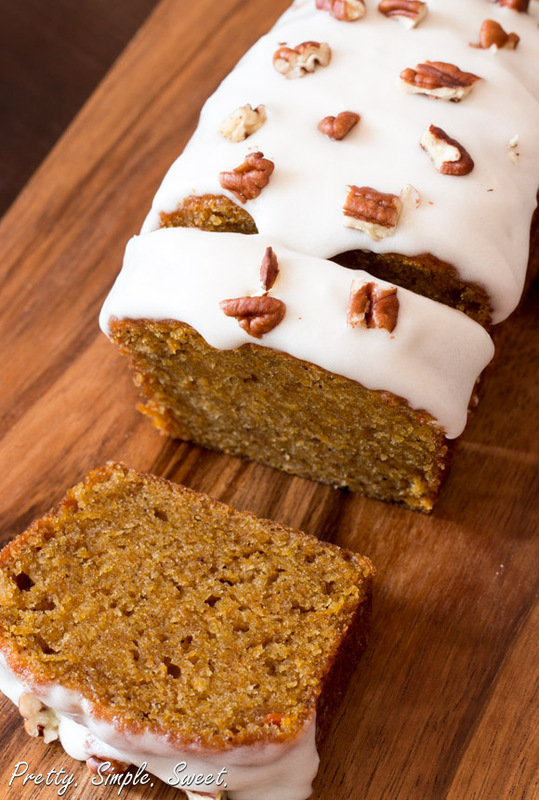 Easy recipe for a moist carrot cake loaf, topped with a sweet and tangy classic cream cheese frosting. I remember the first time my mom asked me to try a piece of carrot cake. She had her way of making us, her children, taste something without telling us what it was made of. She knew we wouldn’t eat it if she did. Although I was skeptical about the orange color of the cake, I tried it anyway because I always loved cakes. One bite is all it took for me to fall in love with carrot cakes. The cake was melt-in-your-mouth-moist and so flavorful that I couldn’t even tell there were carrots in it. Although carrot cakes are usually made as round cakes with multiple layers, I like mine simple, baked in a loaf and eaten alongside coffee or tea. It’s my morning energy snack. Because of the carrots, I like to believe it’s healthy. This cake is super moist – even when eaten straight from the fridge. If you haven’t tried a carrot cake before then you should know that this cake doesn’t really taste like carrots. As with any traditional carrot cake, you can definitely taste the spices in there, yet it’s not overly spiced. In this recipe, I used oil rather than butter. The cake is so flavorful that we don’t need to add butter for flavor. Oil makes this cake fluffy and oh-so-moist. I used an equal amount of brown sugar and white (granulated) sugar because that’s how I like it. You can use either just white sugar or brown sugar or a combination of the two. Brown sugar has a molasses taste and it makes the baked good moister than white sugar does. Yet if you just stick to the recipe, you won’t regret anything 🙂 I love my carrot cake with walnuts, but you can replace it with raisins or use both raisins and nuts (about 1 – 1 1/4 cups in total), or even shredded coconut. This carrot cake is very easy to make! Start by whisking the eggs and sugar until fluffy and thoroughly combined for about a minute or two, then add the oil slowly in a steady stream, and then fold in the grated carrots. You can grate the carrots either by hand on a box grater or in a food processor fitted with a large or fine shredding disk. Next, fold in the dry ingredients and nuts and you’re done! Grating the carrots is easier than you think! It really didn’t take me that long, and I used a box grater. The cream cheese frosting is a classic, but sometimes I omit it because the cake is still delicious on its own! What makes the frosting stiff is the powdered sugar. Add as much powdered sugar as you like. I don’t like a frosting that is overly sweet so I don’t add a lot of sugar. If your frosting is still quite runny yet you don’t want to add more sugar, just pour the frosting over the cake in the pan and refrigerate it. It will firm up once chilled. 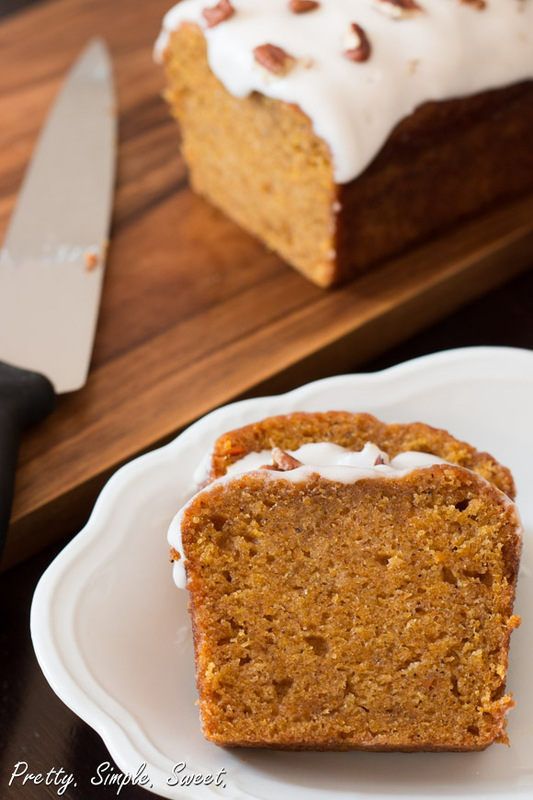 Super moist and flavorful carrot loaf, you won't get enough of it! Note that this cake doesn't rise a lot and that's OK.
Preheat oven to 350F/180C. Butter a 9x5-inch loaf pan (or use a smaller pan, such as 8½ x 4¼-inch, for a higher loaf). In a large bowl sift together flour, baking soda, baking powder, salt, cinnamon, nutmeg, and cloves. Set aside. In a mixer bowl fitted with paddle attachment, beat together eggs, granulated sugar and brown sugar on medium-high speed until light and fluffy, about 2 minutes. On low speed and with the mixer running, add the oil slowly and beat until combined. Beat in vanilla extract until combined, then turn off mixer. Fold in (by hand) carrots until combined. Fold in dry ingredients just until combined. Don’t overmix. Fold in nuts. Pour the batter into prepared loaf pan. Bake for 40-50 minutes or until a toothpick inserted into the center of the cake comes out clean. Allow cake to cool completely. To make the frosting: In a mixer bowl fitted with the paddle attachment, beat the cream cheese, butter and vanilla extract on medium speed for 1 minute until creamy and combined thoroughly. Add powdered sugar and beat until the mixture is fluffy and smooth. If the frosting is too thin, add more powdered sugar until desired consistency is reached. You can add pinch of salt or lemon juice to cut the sweetness. Spread frosting over the top of the cooled cake. Decorate with walnuts or pecans if desired. 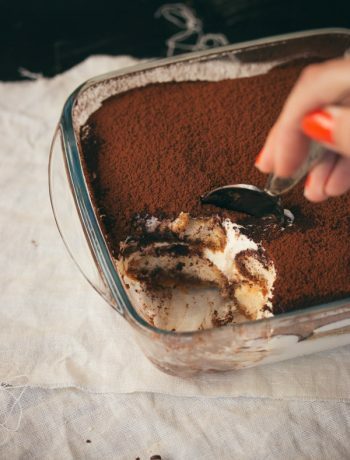 Store cake in an airtight container in the refrigerator for up to 4 days. Carrot cake with cream cheese frosting is the ultimate dessert, and this one looks amazing! Beautiful pictures, too! Hi….this looks sooooo yum!!! Could you help me if I want to make carrot muffins instead of the whole cake?? How to go abt it?? Thanks in advance!! Hi Tanisha! You can definitely make muffins with this recipe. It should yield about 12 standard-sized muffins. Preheat oven to 375F/190C, fill the muffins cups 2/3 to 3/4 full with batter, and bake the muffins for 15-20 minutes until a toothpick inserted into the center of the muffin comes out clean. Thanks Tanisha, I’m glad you like them! In some cases, you can substitute 1 egg with 1/4 cup yogurt or with 1 tablespoon ground Flax seeds plus 3 tablespoons water. But, it doesn’t always bring the best results and since I haven’t tried it myself with this specific recipe, I’m not sure what will be the the outcome. If you want to make muffins instead of a cake, they might turn out too soft without eggs. 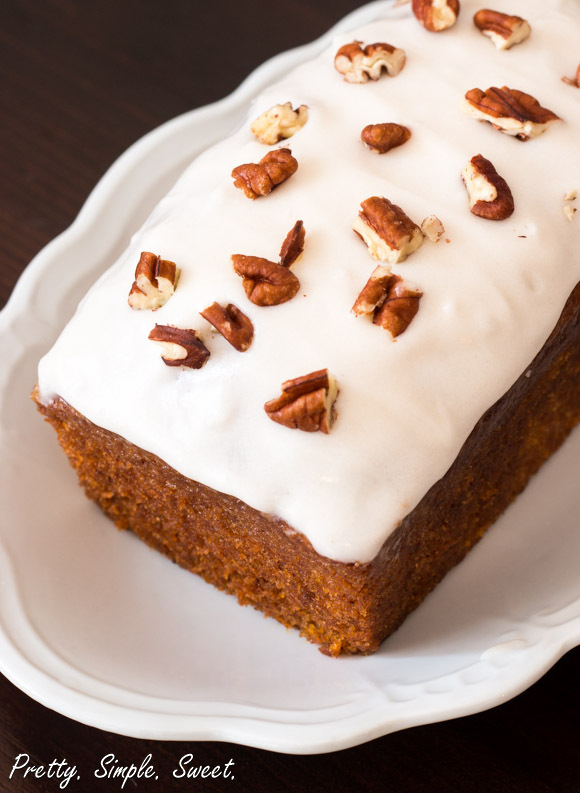 The carrot cake recipe in a loaf is the recipe I’ve been looking for! Looks delicious! Thank you Nancy! I’m sure you’ll love it! I made your carrot cake yesterday. My mother-in-law popped round today and spotted it, in its naked state without frosting. We both had slice with a cup of tea and even without the frosting it was so delicious and moist. came out really well ..i had added some pineapples too..tanx a lot! Since carrot cakes rely on a large amount of carrots for structure, texture and taste, this specific cake will only work with carrots. You’ve just reminded me of my pineapple upside-down cake though, that I really have to post sometime! This looks really good and mines is in the oven right now. I noticed that while making the recipe in the ingredients say to put vilnilla extract in the cake but when I read the instructions it never mentions when to put the vilnilla in the cake. I’m not sure if this is a mistake or I’m just not finding it. You’re right, it’s not mentioned in the instructions, sorry about that! I added it now, but even if you didn’t use it, the cake should still taste amazing! I hope you liked it! I tried this recipe with coconut oil today and it was absolutely amazing! My fiance said he couldn’t help himself and ended up having three servings for desert! LOVE LOVE LOVE it! Hi Shiva! Sorry to hear your cake didn’t rise, I know how frustrating it can be! It could be a number of things; either that your baking powder/soda is expired, or that the oven temperature isn’t accurate and therefore the cake isn’t baked properly or long enough. This recipe looks absolutely delicious and I can’t wait to try it out~! However I do have two questions before I can try it. How does this recipe need to be modified to work for two 8×4″ pans? Also, how well does this recipe hold up to freezing? I like to make multiple loaves at once so I can enjoy one, take one to work and freeze a couple for later enjoyment! Looking forward to more delicious recipes~! Hi Jaymie 🙂 Are you trying to make an 8″ layer cake? If so, check out the instructions here. This cake freezes well! The cake or cake layers (without the frosting) can be wrapped tight with plastic wrap and frozen for up to 2 months. Defrost it overnight in the fridge before using, or if you don’t want to wait for that long, let it thaw in room temperature. Not cake, the bread but in two 8 by 4″ pans as opposed to one 9 by 5″ pan. Thank you for the information on freezing! Ok, I understand now 🙂 I haven’t tried it so I’m not sure. I think the best option would be to multiply the recipe by 1.5 to ensure that the cakes would be tall enough. If you end up with too much batter, you can use the leftover to make muffins. Also, you’ll need to reduce the baking time for the cakes. Great, I was really afraid to try a posted recipe. convertions to metrical units is unique and really works. You’re welcome, Antonio 🙂 Thank you for your comment! So maybe a dumb question but does it have to be refrigerated? Is it Because of the cream cheese in the frosting? It’s definitely not a dumb question! And yes, it’s because of the cream cheese in the frosting. If you only make the cake without the frosting, you don’t have to refrigerate it. Hi! I made this and it was delicious! But just wondering why mine looks like it didn’t bake as high as in your picture? I also used a 9×5 loaf pan as you listed in the recipe. Does your photographed cake use a different size pan? Thank you! Hi Maschell 🙂 I don’t remember exactly, but I usually use my 9*5 pan. However, if you want a taller cake, you can use an 8½*4¼-inch loaf pan instead, just make sure not to overload it with batter. Great recipe! I made it just per your instructions, but just didn’t have nutmeg on hand… It came out moist, soft and yummy even without it, so I can imagine next time it would be even better with the nutmeg powder. Definitely a keeper! Thanks!! Followed the recipe exactly, and the carrot loaf turned out to be great! thanks Shiran! I can’t wait to make this! Since I moved to the UK it’s been hard to find recipes on Pinterest that also have Grams! thank you so much for sharing this! This recipe came out perfect for my husband’s birthday. I made this and it looks delicious but it did not rise very high. Hi Ruthie, this cake doesn’t rise a lot, so as long as it tastes goos, it’s ok.
Can I add crushed pineapple to this if so how much? Hi Rita, if you’re using an 8-ounce can crushed pineapple, use about 1/2 to 3/4 of it. Either drain the juices or add some of it to the batter as well. The batter might be too thin, so if that’s the case, add some more flour, 1-2 tablespoons. I like to use this recipe (only the chocolate cake batter) to make a great, simple loaf. Hubby does not do nuts, can I just leave them out or should I substitute something with them to make up the volume?? Sure, you can leave them out, you can add raisins or shredded coconut if you want but it’s only optional. I made this yesterday, but replaced the 1/2 cup of oil with applesauce. Still super moist and delicious! Just made this and it was exceptional. So much flavor! Mine only cooked for 35 minutes and is perfectly moist. I also put in about 1/4 cup less of overall sugar and it’s still perfect sweet. My new go-to recipe! Hi Shiran, I made this cake in a loaf pan, turned out perfect and I am tempted to try this in a square or round pan (8 or 9 inch). is it possible to do this without having to alter the quantities? pastry flour & brown sugar, still came out light, fluffy and moist as a cupcake. Wonderful flavor. and mixing by hand for a denser breakfast muffin. I made this carrot cake yesterday for my husband co-worker…My husband had a slice and he loved it? Thank you for this excellent recipe? Thank you so much Chrissy! I’m so glad you enjoyed it! I made this cake but I used cardamom instead of the cinnamon and cloves and it came out delicious. So light and airy and extremely flavorful. I didn’t get the rise I would normally get with a loaf but it didn’t matter. Thank you for the recipe! If you greased your pan well, maybe the the cake was still warm. Next time, you can simply line your loaf pan with parchment paper. Once the cake has cooled, lift it out of the pan using the parchment paper. Great recipe! I made it this afternoon and it turned out perfect! So sweet and delicious, I decided to forgo the frosting. The only modification I made was substituting one and one half teaspoon pumpkin pie spice for the cinnamon-nutmeg-ground clove mixture (I did not have ground nutmeg on hand). I will definitely be making this again! Hi Alexis, whenever I want to to adapt recipes for different pan sizes I use this guide. Bake at the same temperature until a toothpick inserted into the center of the cakes comes out clean. I don’t know the exact baking time without testing. Tastes amazing but mine massively sunk in the middle. Still cooked through… but why has this happened. Please help me! It could be many different things like batter was over mixed, leavening expired, oven door was opened many times, or the cake needed extra few minutes to bake. It’s hard for me to know what went wrong without being there, sorry! SOooooooooooo delicious! I added the walnuts PLUS another 1/2 cup of pecans and did not frost, (no cream cheese on hand.) It is amazing. 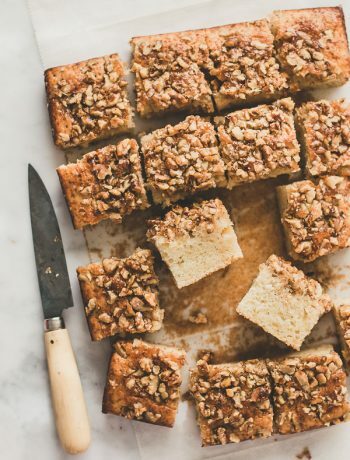 What if you don’t have pecan or walnuts at home is it still ok to make? Yes, you can leave out the nuts. Hi! If I use Self-Rising Flour. What will be the measurement and is there any ingredients from the recipe that I need to take out? Thank you. It’s best to stick to the recipe because self-rising flour has baking powder mixed with it. I’ve made this twice now and both times it won’t rise higher than about an inch :(. My baking powder is new and baking soda my expired. What gives? It tastes good but doesn’t look anything like a loaf. Hi Catherine. This cake doesn’t rise a lot. If it tastes good, moist in texture, and not too dense, that’s how it should be. Hi! If I make 5 loafs what will be the measurement of the ingredients. I know I just need to double or triple the the recipe but I had experienced of some of the recipe I got that I doubled the recipies since I need more batches. It came up so dry and not good. Hope you can give me techniques or correct measurement. Thank you and hope to hear from you soon. I usually just double or triple the recipe and it turns out ok. For large batches, I will make the recipe twice (doubling it each time). Would this recipe still work if I use something other than a loaf pan? Also, is it possible to just stir everything by hand? Hi Sandra, you can stir the ingredients by hand if you don’t have a mixer. This is the second time I’ve used this recipe and once again I’m impressed. The first time I made it my health-police of a husband (lol) said it was a tad oily for him despite the fact that he (literally) ate half the loaf by himself. So this time I used 1/4 cup oil and replaced the rest of the liquid with (full fat😋) yoghurt, added pineapple and it tasted just as great. Thank you for this amazing recipe. Thank you for this recipe, it was delicious ! Hi! This recipe looks delicious! I don’t gave any brown sugar with me at the moment. Is it okay to use only white sugar? I have a convection microwave oven.. Where it tends to cook on top and stay uncooked in the middle… What to do?! I made this recipe at 170 C for 40 minutes. Hi! I’m looking for a good carrot bread recipe to put scoops of chicken salad on for a luncheon. The chicken salad would have dill, celery, lemon juice, dried cranberries and small chunks of apple in it. 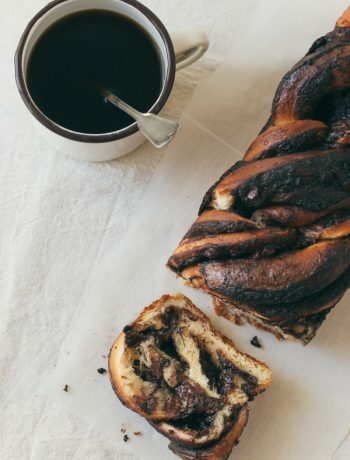 Would this bread work or is it more of a dessert bread? At last I made my 1st ever home made carrot cake. And it turned up exactly like in the pictures, dense and moist. It was so easy. And the best recipe for me! I will never have to buy carrot cake at the stores anymore. 😁 Thank you for the recipe.